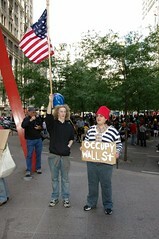 The ‘Occupy Wall Street’ movement has been getting a lot of press. I was startled when I saw that 700 people had been arrested over the weekend for disrupting traffic on the Brooklyn Bridge. That is a lot of people to be arrested and shows that the movement is gaining attention, traction, and publicity. In addition, it looks like there are going to be move ‘Occupy’ gatherings at other cities. Michigan has two planned that I can tell, with the one in Detroit on October 21st already getting attention on local discussion boards. I think it’s interesting that there is no real agenda so far. Nobody seems to be pushing for anything in particular, rather it’s just pushing for things to stop being the way that they are. If I were to ‘Occupy Wall Street’, my protest sign would say something along the lines of: “Computers Are Stealing Your Money. Stop High Frequency Trading.” I think the practice of high frequency trading is awful and it’s a way that investment firms are taking money from average investors and putting it into the pockets of already wealthy individuals and firms. The practice disgusts me. It might be bigger than we think. Let’s face it, the protests at this point seem to be targeting the rich, and among those rich are certainly media conglomerates and those who own them. Could they be squashing how big this movement really is? Or it might not be. If the media companies sense no real threat, they could be showing the protests willingly. Why would they do this? My answer would be that it would desensitize most Americans to the ability to ‘change by protest’. Could it lead to something big politically? I wonder if this could impact the 2012 election, whether it be the Republican primaries or even encourage a more forceful third party that could impact the election. Number five might not even be possible. To gather any type of political stronghold, there would have to be leadership and a clear agenda that’s agreed upon. Right now there isn’t any true leadership to this movement, and a political agenda of any sort would most likely alienate some members. What’s next for Occupy Wall Street? I don’t think anybody really knows. Do you know anybody that’s involved in this protest/movement/gathering? If you were to send one message along, what would your message be?